The Best Fitness Tracker? The One You Actually Use. If you’re looking to maximize your workout results or simply increase your daily activity, you’ve likely considered purchasing a fitness tracker. These wearable devices deliver a wealth of data that can help you assess your lifestyle and tailor your fitness efforts—but they’re often not used to their full potential. While one in five Americans owns a wearable a device, a large percentage of people admit they stop using fitness trackers once the novelty wears off. Counting steps can quickly lose its luster. Maybe we’re looking at fitness trackers all wrong. If you’re in the market for a wearable device, or if you have one taking up space on your nightstand, it might be time to evaluate your perspective. The experts at eBags are here to help. We’ve assembled this guide with some of our favorite products and tips for getting results. Fitness trackers now monitor a variety of metrics that offer a more comprehensive picture of wellness. They can give you insight into everything from stress management to sleep quality. EXPERT TIP: While fitness trackers offer more points of data, knowing how to decipher and apply that data can be a challenge. Consider consulting a personal trainer or physician to help. A trainer, for example, can teach you how to monitor and control your heart rate during workouts. Personal training can be pricey, though. Group classes are another option. You won’t get the same one-on-one attention, but trainers often share their expertise during class or answer questions afterward. MUST-HAVE: The Bellabeat Leaf Urban not only tracks your steps and calories but also monitors sleep quantity and quality, menstrual cycles and stress levels. When stress is high, its guided meditation feature can help you refocus. Bonus: The Leaf Urban looks like a fashionable piece of jewelry and can be worn as a bracelet, necklace or clip. One of the strengths of a fitness tracker is that it can show us how little decisions add up to big change over time. Walking 1,0000 more steps might not make a difference in one day, but over a week or a month, it can. EXPERT TIP: Wearable devices have faced criticism for inaccurate or inconsistent data. They aren’t perfect, but the technology is improving. Instead of getting caught up in minutia, consider the data within the overall context of your lifestyle and look for trends. Is there a particular day of the week that being active seems to be a challenge? Why is that? If you burned fewer calories, can you identify what you did differently? Use data to help you identify questions and seek solutions that lead to positive change. MUST-HAVE: If you’re working on the go and hoping small changes in steps, distance and calories add up, consider the Fossil Q Gazer Leather Hybrid Smartwatch. Track basic fitness metrics and receive alerts to calls, emails, and texts. This watch also looks like a traditional, stylish watch rather than a rubber bracelet. The MyKronoz ZeRound offers many of the same features at a lower price point and also includes a display screen. When you buy a fitness tracker, you’re committing to your overall health. You should set goals that motivate you to become your best self. Walking 10,000 steps a day? That’s a good short-term goal, but chances are, that alone isn’t going to motivate you toward a lifestyle change. EXPERT TIP: Think of a fitness tracker in terms of your big-picture goals and how it can help you get there. Focus first on what you really want to achieve, not what a device can track. For example, if your goal is to run your first 5K. How many miles would you need to walk/run per week to adequately prepare for the race? The goal should be about you, and it should be something that gives meaning to the data. MUST-HAVE: With built-in GPS, the Samsung Gear Fit2 tracks a variety of sports and strength-training exercises, as well as steps and heart rate. The accompanying app will allow you to track daily progress and review up to a month’s worth of data. What will spur you to get out of bed an hour early to get to the gym? What will encourage you to choose healthy foods? Sometimes it’s saving face with your family and friends. EXPERT TIP: Some people enjoy the solitude of an early-morning run, but most of us need workout partners or friends as a source of accountability and encouragement. Participate in the social community that accompanies many wearable devices, or get your friends and family involved via social media. You might inspire others to start their own fitness journey. MUST-HAVE: Sometimes all it takes to motivate your body is a good tune. The TomTom Spark 3 comes with GPS tracking, records fitness data and, wait for it, allows you to store up to 500 songs without carrying your phone. Got your fitness goals defined for 2017? Great! Get thoroughly geared up with eBags’ best-selling gym bags and fitness apparel. Rebeccah is a mountain girl turned beach bum who has explored beautiful destinations all of her life. She grew up hiking and mountain biking in the New River Gorge of West Virginia and now lives on Florida’s sun-kissed Gulf Coast. Her best days start on her family’s boat and end with oysters and cold beer at the local raw bar. She and her husband are focused on rearing the next generation of Lutz fishermen. (The first gift she bought her son, when he was still in the womb, was a lifejacket.) Rebeccah spent 15 years working in newsrooms and traveled the globe, reporting from places such as Meulaboh, Indonesia, and Sudan’s Nuba Mountains. Her international travel since then has been less dangerous, yet still an adventure — a 12-day cruise around the British Isles. “New year, new you”…easier said than done. Waking up for that 5 a.m. spin class seemed quite a bit more doable last night at 11 p.m. New habits can be hard to form, but 2017 has arrived with a crew of high-tech motivators to get you moving and keep you grooving all year long. Whether zombies are chasing you or a smart-mouthed coach is serving up motivational sass, these 9 fitness of the best apps and gadgets will be your new favorite workout buddies. Gone are the days of shelling out the big bucks for a personal trainer. There’s no need for an IRL trainer when you can get a gym app on your phone for a monthly fee that’s equivalent to a grande latte. Fitness apps like Sworkit, FitStar, and Carrot are revolutionizing the virtual trainer concept. FitStar, created by FitBit, helps you achieve your fitness goals in record time for only $7.99 a month. FitStar’s catalog has more than 40 themed workouts with different trainers who offer video demonstrations and step-by-step coaching. Ironically, Sworkit is the buffet of all fitness apps: you enter the type of workout you want (strength, cardio, yoga or stretching) and the amount of time you have (from five minutes to an hour) for a personalized workout that requires very little pre-planning. Sworkit is free, but for $4.99 a month, you can get ultra-personalized by determining the areas of your body you want to focus on even setting the number of reps to want to do! REAL-GIRL TIP: If you do decide to take the DIY route to getting fit, good music is a necessity. From an unprofessional athlete’s point of view, more volume = more sweat. Drop the bass and give me 20, pumping your virtual coach (and maybe some Drake) at full volume through these Nyne speakers. These sleek accessories come packed with sweet features: Bluetooth connectivity, built-in USB charging for your phone, a hidden carrying handle, and a built-in microphone. Achieving goals is much easier when you set measurable goals that you can gauge your progress against. Rather than vowing to “walk more” you should say “I’m going to walk 3 miles every day” or “I want to burn 900 calories every week.” Keep your eyes on the prize with a TomTom smart watch, which gives you live stats about your heart rate, distance traveled, pace, and calories burned. TomTom is even GPS enabled so you can keep track of your favorite running routes. At the end of the day or week, you’ll be able to #humblebrag about your leaps and strides. For more about eBags’ best fitness trackers, check out Rebeccah’s roundup. Seriously. Run. Run like humanity depends on your survival. Feeling motivated yet? If you can’t find your running mojo unless zombies are chasing you, there’s an app for that: Zombies, Run! This workout app has 200 award-winning missions designed to get your heart pumping by fleeing the undead. You can walk, run or jog away from the flesh eaters, captivated by the audio story and music rather than thinking about side cramps. Scared of zombies, even virtual ones? Perhaps a simple soundtrack will do the trick. Spotify Running gives you a non-stop mix of music it knows you’ll love (choose from hip-hop, electro, pop or “recommended for you”) that changes to match its tempo with your pace. Running in time with music helps raise energy and motivation levels so you can go faster and further than ever before. Sustainable fitness goals start with solid logistics. First, let’s find a class you like. Enter ClassPass, which aggregates all of the workout class options in 36 cities nationwide. Rather than entering into a committed relationship with Zumba, the ClassPass monthly fee lets you date around: maybe you opt for hot yoga one morning, but head to kickboxing the next night. This is awesome for avoiding too much repetition and finding your perfect fitness fit. Once you’ve finished a workout, log it on your Workout Calendar—an app that’s as straightforward and simple as it sounds. The calendar displays check marks for days when you exercised and, upon tapping, shows details like the number of reps, distance, and other inputted notes. Cheers to a healthier you and habits that really stick. Technology seems sedentary by nature, but we know these innovations will get you fired up and off your duff—so prepare yourself to look great, feel fantastic and absolutely slay your fitness goals in 2017. Quality gear makes all the difference when you’re committing to a workout routine. Get a great start in 2017 with eBags and fitness coach Shannon Colavecchio. You know that feeling you get when you’re sporting new fitness equipment or apparel? You feel strong, confident and ready to rock your workout. Turns out, there’s some science behind that mojo. The right gear or clothing can motivate you. Scientists call this “enclothed cognition.” It’s a phenomenon fitness enthusiasts know well, and it certainly holds true for one of your most important gym accessories. Behold—the power of the gym bag. A new bag can keep you organized and push you toward your goals. “You feel prepared. You’ve got all your stuff in the bag. It kind of ups the game,” says Shannon Colavecchio, a nationally recognized fitness blogger, brand ambassador and gym owner. The eBags experts know quality bags, and Shannon knows working out. Together, we created this guide to help you get to and from the gym with ease in 2017. Gym bags come in a range of sizes, from the lightweight backpack to the oversize duffel. Think about your routine and choose a bag that will carry your essentials without unnecessary bulk. MUST-HAVES: The Apera Performance Duffel has immense storage capacity and is designed for road warriors who are living and working out of their bags. You can store and easily access all of your fitness and workplace necessities. 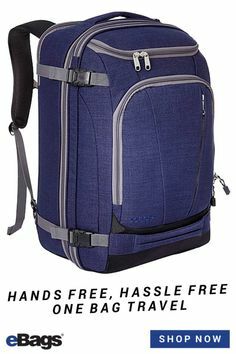 If you’re carrying less, a smaller duffel like the Nike Brasilia 6 comes at an affordable price but still has important features including separate wet/dry storage. Compartments are a must. 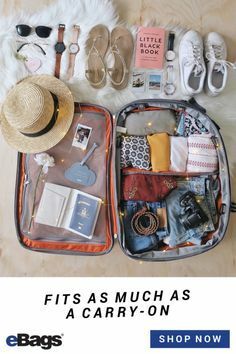 Your routine will dictate which compartments are most important but consider separate areas for wet and dry clothes, shoes, toiletries, your phone, car keys, laptop, and tablet. MUST-HAVES: We love the Lug Propeller Gym/Overnight Bag, which includes designated space for jewelry and cosmetic brushes, a slide-through compartment for a yoga mat or jacket and two exterior pockets ideal for water bottles or an umbrella. The Adidas Studio Duffel opens wide to easily pack all of your gear but has interior and exterior compartments aplenty to store your items. SHANNON’S TIP: Avoid shuttling items between your home and your gym bag, which increases the likelihood that you’ll forget or lose something. Keep travel-size versions of everything (shampoo and conditioner, toothpaste and toothbrush, deodorant, etc.) in your bag. Also, create a second makeup bag that can “live” in your gym bag. Carry a little attitude into your workout with a burst of color or an eye-catching design. MUST-HAVE: The Baggallini Step-To-It Duffel has every function you need in a gym bag and pops with bright exterior colors including Tangerine, Cobalt, Grass, and Magenta. The interior is designed with a complementary hue, creating a bag with personality plus. SHANNON’S TIPS: When you meet a fitness goal, reward yourself with a new gym bag, outfit or pair of shoes. New gear complements the new you. A sassy gym bag can absolutely be a motivator. Getting to the gym from the office, the after-school pick-up line and all places in between can be a hassle. The last thing your gym bag should do is make you uncomfortable. “It definitely needs to be easy to wear and carry as you come and go,” Shannon says. MUST-HAVES: If you’re on the go, a hands-free backpack is a great option. We love the Apera Locker Pack, which is roomy, but sleek. 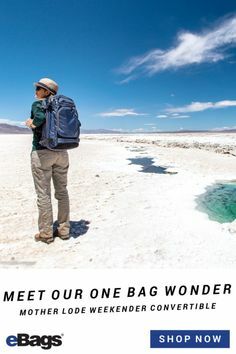 And, as the name suggests, a clamshell pocket and ingenious interior structure make this pack function like a portable gym locker—no combination required. Small details such as padded straps make a big difference when you’re carrying a gym bag, especially if it’s an everyday thing. The Under Armour Undeniable MD Duffel II comes with a cross-body strap designed for comfort. SHANNON’S TIP: Prepare for the unexpected by keeping extra socks and undergarments in your gym bag. You never know when you might need them. Tell us what you look for in a great gym bag, and share your tips for maintaining a fitness routine in the comments section. Shannon Colavecchio is an ACE and AFAA-certified Master Trainer for Indo-Row®, Shockwave® and Tabata Bootcamp. She leads certifications around the country and has presented for IDEA PT East, SCW Mania and NPE Mega. Shannon owns a fitness studio in North Florida and serves as an ambassador for fitness and wellness brands including Rykä. She served as a MyGroupFit national correspondent in its inaugural year and is a freelancer and expert source for publications including Women’s Running and Runner’s World. Her Girl Power Bootcamps, created to empower girls ages 6-11 through fitness and nutrition, have been featured on ESPN. As a nationally recognized fitness blogger ambassador with Fitfluential, Shannon has worked with brands including GNC and Quest Nutrition. Baby, it’s cold outside. Like, really cold: frigid temperatures across the U.S. are setting record lows. Luckily, chilly weather tends to arrive with a side of snow. So get out there and take part in seasonal activities, whether it’s skiing, snowboarding, ice skating, snowshoeing or hiking through a winter wonderland. Even if the mercury drops below zero, these inventions will help you seize the day. Got your sights set on the slopes? Know the conditions before you go with On The Snow. This app relies on GPS to display ski and snow reports in the surrounding mountains, including details about the base pack, fresh snow, open lifts and mountain webcams. Liftopia is a similar app and website that marries mountain conditions with lift ticket deals, helping you book ahead to save big. If you’re a curious snow bunny, the PeakFinder app can make every run an educational experience. It integrates GPS with augmented reality so that you can point your phone at the mountains and see each peak’s name and elevation. The app works offline and around the world, enriching your knowledge about peaks from the Appalachians to the Himalayas and beyond. Whether you track your performance on the slopes for personal or professional reasons, there’s an app for that. Trace measures your speed, vertical gains/losses, jumps, calories and more at any ski resort. This app lets you compare and share with anyone so friendly rivalries can light your fire on the mountain. Looking to meet even more friends? Check out the Yonder app, a social network for outdoor enthusiasts. Yonder fosters a fantastically engaged community of active nature lovers on and off the slopes. Even if you’re not in a social mood, Yonder offers unrivaled discovery capabilities. The app boasts an interactive map with reviews and photos—it’s mostly user-generated, and you can follow your favorite outdoorsmen and women. It’s nearly impossible to ruin a day spent in the snow-dusted outdoors. The wilderness is proven to boost your mood—just one of nature’s brain benefits—but a buzzing cell phone is its kryptonite. Unplug with the help of the OFFGRID app, which functions like an enhanced “do not disturb” mode. OFFGRID activates with the push of a button, and will automatically notify anyone who tries to reach you that you’re away from your phone (or set a custom message). When you do venture online again, you’ll get a detailed report of what you missed, eliminating any FOMO anxiety. Fanny packs are wonderful, underrated accessories year-round, but pack a particularly potent punch during winter. Their lower-abdomen placement means that your gadget stays warm, adding hours to its battery life, and this moisture-repellent pack protects your phone from water damage. The zippered enclosure ensures that your devices won’t accidentally slip onto the slope. Plus your phone is easy to reach—the convenient placement means you’ll never miss another call or spontaneous snowy snapshot. Speaking of batteries…when in the great, frigid outdoors, it’s never a bad idea to carry a backup battery. When energy and daylight are running low, a portable power source is a modern-day superhero. We love the Lifejacket Battery because it carries several full charges for most devices and has a visible power indicator. You’re never too old for a good old-fashioned snow day. Whether you ring in 2017 with a snowball fight or a black diamond run, go forth and embrace your local winter wonderland. 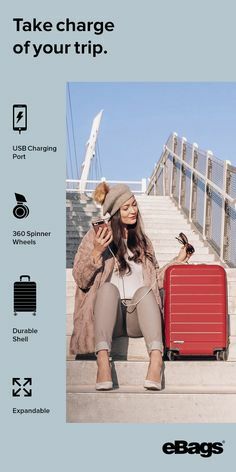 Check out eBags Connected Travel offerings! As the holidays are such a popular travel time, we’re gifting you with a free lesson: how to be your own tour guide. A little research can go a long way—the more preparation you do in advance, the more time you’ll have to relax and explore. Furthermore, preparation does wonders for group synergy; rather than debating the day’s plan over a lengthy breakfast, you can agree on a loose agenda in advance, so the group can wake up and seize the day. And, while hotel concierges and travel agents are your friends, sometimes their abundance of information can be overwhelming. Knowing for certain a few things you’d like to do will help productively guide conversations at the front desk—if you’re in Prague and insist on seeing the John Lennon Wall over the Museum of Communism, for example, this will lay the groundwork for personalized recommendations. Do a little digging about your destination using these sites and apps to find truly unique cultural experiences…on your own schedule! Before you take off on any adventure, use the web to bone up on basic destination information. Sites like Fodor’s Travel have suggested itineraries based on location as well as the duration of your vacation. If you’re traveling on a shoestring, check out Millennial-focused Indie Traveller. If you’re traveling with a posse of kiddos, find tips on Family Vacation Hub. Creating a rough game that groups various city activities by proximity to one another, eliminating backtracking and reducing travel time between attractions. You also might want to spend a few minutes on your destination’s Wikitravel site, where you’ll find a laundry list of fun facts about the place you’re about to visit. Jot down your favorites in an easily accessible place—whether it be the “notes” app in your phone or an actual notepad—so you can whip out a historical anecdote at a moment’s notice. For bonus points, research the locals’ favorite spots for when tummies inevitably rumble or the clock strikes five. Save these locations in an offline mobile map, like Citymaps and Maps.me, so you always have instant access. The best guidance typically comes from locals—but if you don’t have access to real-life residents, not to worry. You can still leverage pro tips with the Detour app—a beautifully produced audio GPS walking guide narrated by natives. Detour is location-aware, so the audio is synced between your group members—plus the narrative and navigation follow you through every twisted alleyway. Some of the hidden gems it points out are hiding in plain sight, while others are destinations unto themselves. So far the guide is in 10 cities, including Berlin, Marrakech, San Francisco, Paris, and Barcelona. If Detour hasn’t made it to the locale of your choice yet, you can still follow an excellent tour on the Field Trip app by Google, which points out hole-in-the-wall restaurants along with major landmarks. Or—brace yourself—you can use the old-school approach: a real human tour guide! I love being able to ask the guide locals-only questions, plus the group setting makes it easy to meet other travelers. Group tours are often budget-friendly, and operators like Sandeman’s and Free City Tour are in most European cities. Imagine if you could sort through photos to find the prettiest street to walk down. Streetography is a new app that does exactly that. Its grid looks like a pastel block party and is interactive so you can pull up photos from multiple sources. This app lets you filter the photographs by date, by source (photos taken only by teenagers, for example), by neighborhood and more. It’s a fantastic tool to gauge an area’s vibes before you go and make sure you don’t miss a Kodak Moment. “Excuse me, where is the….1) Bathroom? 2) Bar? 3) Bus stop?” Nail those phrases and you’re set. Bravolol is an excellent tool for learning a new language when your objective is learning phrases. If you’re permanently relocating to a foreign country, you may want to dive into verb conjugations in the past and future tense…but if this is just a short stint, phrases are your bilingual highway to success. On Bravolol’s website or app, you can practice more than 800 commonly used phrases, sorting them by greetings, emergencies, eating, shopping, romance, numbers—the app even has a talking parrot so you can repeat the phrases back to him. Bravolol offers guidance in Spanish, French, Korean, Japanese, Chinese, German, Greek, Vietnamese, Hindi, Russian and more. Finally, technology that improves human-to-human interactions! The key to having success in a foreign country lies in communicating with locals. Ten guidebooks can’t top the insider knowledge of one native. You prepared, you came and you conquered. After pretending to be a local, it may be hard to ever board that plane back home! But if all else fails, you can always stay on indefinitely…as a professional tour guide. The world of Connected Travel starts here! Greetings from Christmas card season! We hope your holidays are jolly and bright…and that you got that holiday photo “just right.” We live in the age of “pics or it didn’t happen!” and that’s a wonderful thing; photograph is a way of immortalizing a memory, helping one remember happy nuances as time passes. Sometimes a photograph catches beautiful details that one might miss at a first glance, whether it’s kitten peeking through a frosted window or friends caught in an embrace. Regardless of the final destination of your photos—your mantelpiece, on a Christmas card or shared online as a means of full-time income—these tips will have you embracing and excelling at taking photos this winter. 1) You’ll never have to cut a photo shoot short due to a “memory full” notification. 2) Photo sharing is instantaneous and easy. 3) If, heaven forbid, something happens to your device, your photos and videos are still safely backed up on the Flickr cloud. The Facet travel app and website is an incredible way to get exposure to beautiful destinations before you go. The visually pleasing layout is awe-inspiring, with a “trending” tab (currently trending: adventure travel, Stockholm, Barcelona, drone views, brews, and deserts) and “destinations” tab (featuring New York, Hong Kong, Southeast Asia, Los Angeles, Japan, and Sayulita). Basically, it’s like Flickr meets Tumblr meets Lonely Planet. Within each destination, you can sort users’ images by see, do, eat, nature, time lapse, urban life, and drink. These photographs convey far more than a guidebook or blog ever could. Beyond helping you gauge a place’s mood, Facet provides a plethora of ideas for vantage points and angles. So when you finally touch down, you know where to go so you can snap the very best shots with ease. Foggy photos rock (check @livefolk for inspo). Snow-dusted photos rock (see @jimmy_chin for inspo). Ocean photos rock (follow @ocean for inspo). Wet equipment…doesn’t rock. A mini-investment in a watertight camera bag will keep your gear dry and functioning if the weather forecast is anything but 100% sunny. If it’s particularly frigid outside, try to keep your camera on your body for warmth. The colder it is, the faster its battery will drain. The difference between a pro photo and a phone snapshot often comes down to sharpness. Luckily, there’s an easy hack to make your iPhone photos appear like they were shot on a DSLR—simply take them with a portable tripod. You can bring flexible mini-tripods anywhere, as they can fit in your satchel and bend to be propped on cobblestone or wrapped around a tree limb, koala-style. A tripod combats shakiness and lets you experiment with unexpected angles. For taking photos from afar or going wild with a self-timer, bring an affordable and tiny phone remote on your adventure. This is a must-have for nailing the perfect group photo. Selfies are far more than a fad: a selfie stick is practically a household commodity. Get your beautiful face in the shot, whether it’s with the fam, locals or an ancient landmark. Gone are the days of posing for a camera with a slow shutter speed—selfies allow for silly photoshoots and creative freedom. We recommend an adjustable selfie stick (or “monopod” if you must) so you can stow it in a back pocket or purse. While professional cameras can’t be beat, smartphones come pretty darn close—the iPhone 7 and Pixel Phone both boast a 12MP camera. Here are some tips to take your iPhone photos from “pretty good” to “Nat Geo centerfold.” My only beef with phone photography is that my phone tends to die much faster than my camera, given I’m using a gazillion other apps in addition to the camera. Luckily, this problem has a simple solution known as a portable charger. Plug it in and boom! you just won ten more hours of battery life. Wouldn’t it be cool if your entire adventure was captured with virtually no effort or interruptions? The Drift Compass Wearable HD Camera does exactly that. This little camera captures the world from your point of view, and has several modes: from live-stream to time-lapse, all in crystal-clear HD. Simply attach the Compass camera to your body (it’s similar to a GoPro in this sense) and it will automatically snap away throughout the day—one charge lasts four hours. The camera syncs to the Drift app so you can control the camera from your phone, whether you’re adjusting the viewfinder or capturing photos and videos. Maybe She’s Born With It. Maybe it’s Snapchat. A little photo editing at the end of your day—maybe snuggled between crisp hotel sheets, or while resting your head on the window of a wobbling train—can go a long way. What’s more, some of photographers’ favorite tools are on apps, meaning that editing can be done in the palm of your hand, on the road. Snapseed, developed by Google, is a powerful photo editing tool that lets you tune, crop, transform, rotate and spot-repair your images. If you wanna get funky, you can play with the intensity of Snapseed filters. For even more filters that add flare while still looking natural, check out VSCO and Afterlight. So snap away, as photographs turn memories into something warm, fuzzy and tangible. Whether you post ‘em or print ‘em, you’ll be happy you took ‘em. Cheers to a photo-liscious 2017! 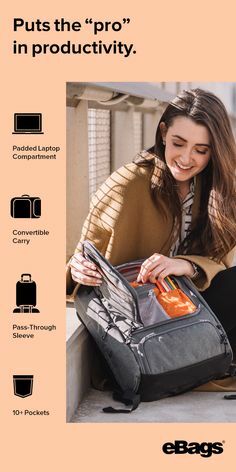 Learn more about eBags can provide a truly connected travel experience for your next trip! When we first had the vision for the eBags Connected Luggage Tag—an app-enabled digital ID tag that helps safely reunite travelers with lost luggage—we were almost as excited by the design of the tag itself as we were about its high-tech functionality. Not only would our tags help people carefully control the contact information they share with the world (including Uber drivers and random lurkers at the baggage carousel), they would also enable #wanderlovers to express their unique travel style and destination aspirations. @carakuulei is a full-time traveling content creator and lifestyle model as well as the Co-Founder of Kill It On Instagram, an online coaching program designed to help businesses increase their business fourfold via Instagram. Her passion for content creation has transformed businesses all around the world. @pavidderry is a Toronto-based photographer who’s been taking photos ever since he can remember—starting with a series of disposable cameras before transitioning to film, then iPhone and finally DSLR. His winning designs were taken in San Francisco and Big Sur, California, as well as his hometown of Toronto. @mrvalography is a photographer based in the Pacific Northwest. He is focused on inspiring others with his artistic perspective and meaningful captions while cultivating a creative community on social media. Valeriy is driven by adventure, and passionate about exploring the world around him. The Best $5 You’ll EVER Spend on Travel. So what’s so great about the eBags Connected Luggage Tag? With traditional luggage tags, your deets are publicly displayed, for anyone to see. What’s more, the information on a traditional tag is static, so these tags can’t account for the unexpected schedule and location changes that are part of the modern journey. But with our app-enabled tag, your info is stored in the cloud—so it can be updated anytime, from anywhere. The eBags app is free, and the tag is incredibly easy to use. After downloading the app, simply follow the prompts to name your bag, then enter their contact information and indicate which personal details you’d like to display. 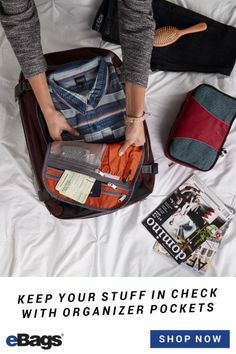 Then link your BAG to your TAG in one of three ways: by scanning the QR code, tapping the chip on your NFC-enabled phone, or entering the Tag ID listed on your eBags Connected Luggage Tag. If your bag does try to see the sights without you, simply use the app to mark it as lost, then take a moment to confirm or update their contact information. When somebody finds your bag, all they have to do is scan the QR code or visit the URL on the tag to get in touch using the eBags app! No more sharing your home address with everyone at the baggage carousel…and no more 100% avoidable missed connections. The eBags Connected Luggage Tag retails for $4.95, and is available exclusively at eBags. There are 19 different tag designs to choose from, and they’re ALL goin’ like hotcakes. Get yours today! 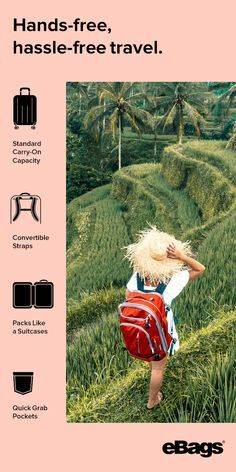 There’s a reason eBags Classic Packing Cubes are our hands-down our most popular product, with consistent five-star ratings from zillions of happy customers—a few reasons, actually. Imagine unzipping your suitcase after a long day of traveling, and finding everything exactly where it started. No silky tops crushed in the corner; no medication bottles migrating goodness knows where. Now imagine arriving at your destination during an unexpected cold snap. You COULD rummage through your bag for a warmer layer, or you could reach for the canary-yellow Packing Cube—it’s right where you put it this morning when you packed! And if you’re staying somewhere for a night or two, there’s no need to live out of your suitcase. Just place your Packing Cubes directly in the dresser drawers and voila! Instant next-level neat freak. Pure Packing Artistry—Hand-Picked by YOU. People love our Packing Cubes SO much—and WE love the diverse “travel personalities” of our customers. We’ve also built our business on real-world expertise, so when we wanted to expand our Packing Cube family to include fresh new patterns, we turned to the ultimate authorities: a group of up-and-coming designers from Los Angeles. The Perfect Stocking Stuffer for Travelin’ Folk. All of our Artist Series Packing Cubes are part of a limited-edition run, so when they’re gone—they’re really gone! They make amazing stocking stuffers for traveling friends or family members, or even organizational aids for the home; we’ve heard all kinds of great stories about the unexpected ways in which people use our Cubes, from cutting down dresser-drawer clutter to flexible Lego storage and beyond. It’s also a great time of year to give yourself the gift of stress-free travel…which, thanks to our great pricing, is also a guilt-free extravagance. I chose to pair this packing cube set (copper) with the eBags Weekender Convertible Carry-On Backpack (burnt orange). I am very pleased with them. 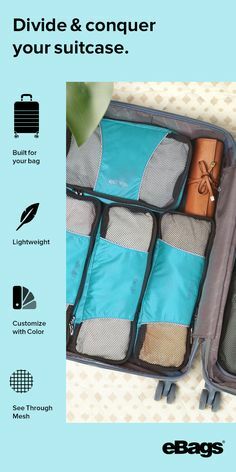 The three packing cubes are conveniently sized to fit in carry-on luggage. Their quality seems as high as that of another major brand of packing accessories, while the price is substantially less. Shop the Artist Series Packing Cubes, Classic Packing Cubes or our Ultralight Packing Cubes now. We can virtually guarantee you’ll wonder how you EVER lived without them.